Spring Petclinic is on Github! We are pleased to announce that the Spring Petclinic sample application has been refactored. Data Access Integration using jdbc (JdbcTemplate), JPA or Spring Data JPA (repository layer). You can choose which implementation to use by setting up the corresponding bean profile in web.xml or in one of the JUnit tests. Spring MVC: content negotiation (html, xml or atom) using ContentNegotiatingViewResolver. We have had quite a lot of contributions from experts in our community (including the leads of several open source projects). 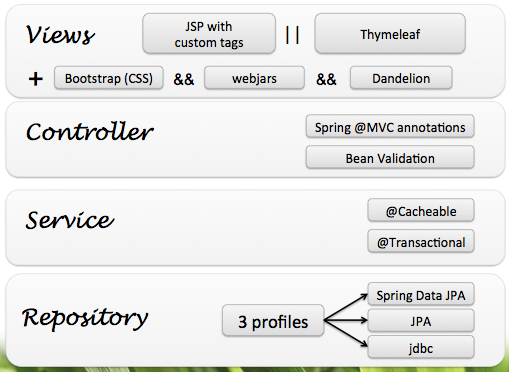 In case you haven’t heard of it yet, Thymeleaf can be seen as a replacement for JSP. it defines itself as an XML / XHTML / HTML5 template engine. It is based on some plain HTML files with a little bit of namespace magic. Dandelion provides a set of taglibs that you can use with JSP or Thymeleaf. We have used it inside Spring-Petclinic to work with DataTables. It generates tables based on jQuery DataTables and Bootstrap. Dandelion is used inside the main branch of Spring Petclinic. By default, Spring Petclinic uses Maven as it is the most common choice for Java applications. While Spring Petclinic is fairly small in comparison to most real-life applications, its Maven pom.xml file is pretty verbose already. Li Yanhui from Thoughtworks China has been nice enough to migrate Spring Petclinic to Gradle. That is a great way to compare Maven and Gradle side by side. The build.gradle configuration file is indeed much simpler to understand. It currently contains 143 lines (as opposed to 543 lines for the Maven POM). You can browse the Gradle-based version of Spring Petclinic here: https://github.com/whimet/spring-petclinic Thanks to them we have been able to identify a few places inside Spring Petclinic that contained code duplication and lacked of automated testing. Would it be possible to take Spring Petclinic as it is now and scale it up to 1000 requests per second on a single server instance? Julien Dubois from Ippon Technologies has written a great series of five blog entries on that topic.